By about 142 to 140 BC, the Roman monetary system goes through a suspension of the minting of the Roman bronze As. 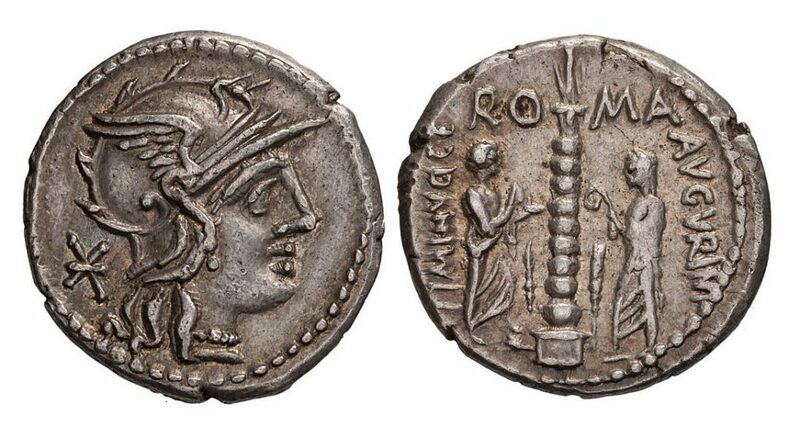 Previously, the silver denarius was valued at 10 bronze As denoted by the “X” on the obverse behind the bust of Roma. 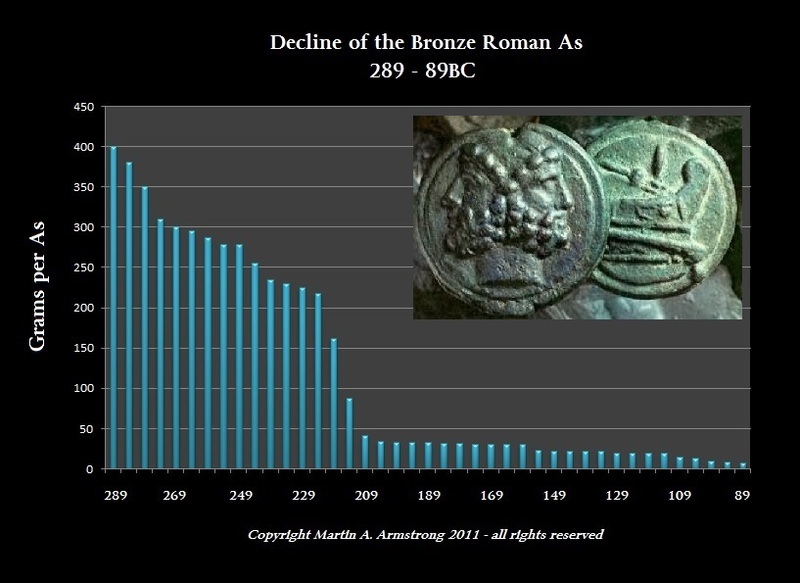 The bronze As has declined in weight significantly from one pound of bronze down to 23.5 grams – less than one ounce. It appears that the use of bronze diminished and silver had replaced the old As standard. The Denarius is then retariffed to 16 asses, indicated by XVI on the obverse of the denarius. This revaluation to the bronze is commonly dated to 142/141 BC. The denomination “uncia”, which was originally one troy ounce of 31.1 grams fell to under 2 grams in weight. The clear marking with the number XVI denoting 16 asses was soon again replaced with a monogram XVI with the X appearing with a cross through its center. The re-tariffing appears to have been a shift in sentiment among the Roman people that silver was the new standard as wealth began to rise. If it were due to bronze becoming scarcer, then the denarius should have been devalued relative to the bronze instead increasing in value. The new value of the Roman denarius-to-bronze-as-ratio, in fact, lasted for hundreds of years until the monetary reform of Augustus (27BC-14AD) where the base unit of account was altered from the Roman as to the Roman sestertius. This may well be an indicator of overall inflation, the weight of the denarius remained exceptionally standard until the reign of Nero (54-68AD). Here is a picture of the Roman As from 240BC until the reign of Nero comes to an end in 68AD. This decline was interestingly 309.6 years (6 waves of 51.6 years). 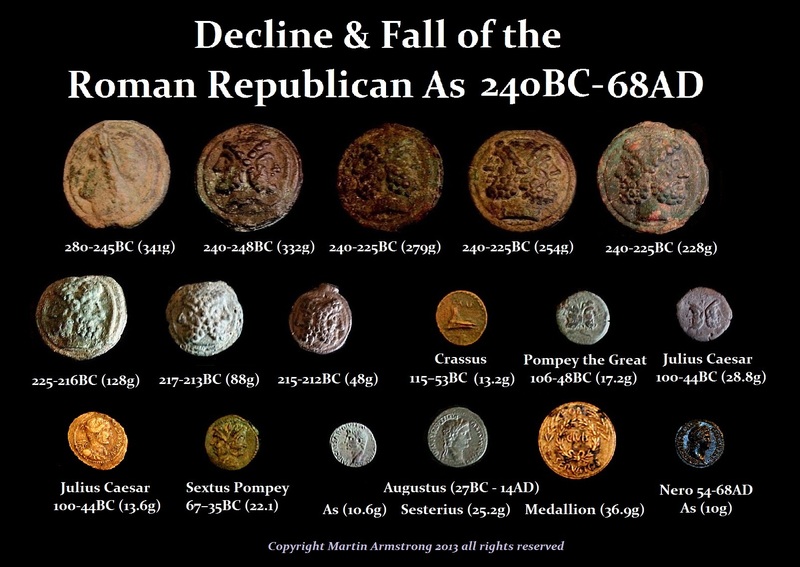 This period in the Monetary Crisis of 142-141BC resulted in the suspension of the minting of the Roman bronze As. There were no such coins issued at all between 146BC and 113BC. The As makes it reappearance just before the Roman Civil War between Caesar and Pompey.